Light as a feather, this large fabric petal with its undulating lines fascinates us with its light. The Plena pendant stands out for its considerable volume yet dynamic, light presence. The wide, flat diffuser consists of a double layer of white fabric made of a special reflective PVC. This type of fabric is generally used for large backlit illuminated screens. The fabric is stretched on a lacquered aluminium frame. The arch that supports the diffuser is also made of lacquered aluminium. The two elements that make up the lamp, the petal and the arch, compensate for each other, forming an almost poetic equilibrium. The broad arched petal is as if frozen in a perfectly natural movement, that of a sail in the wind. Plena’s appearance changes according to the perspective of whoever sees it. 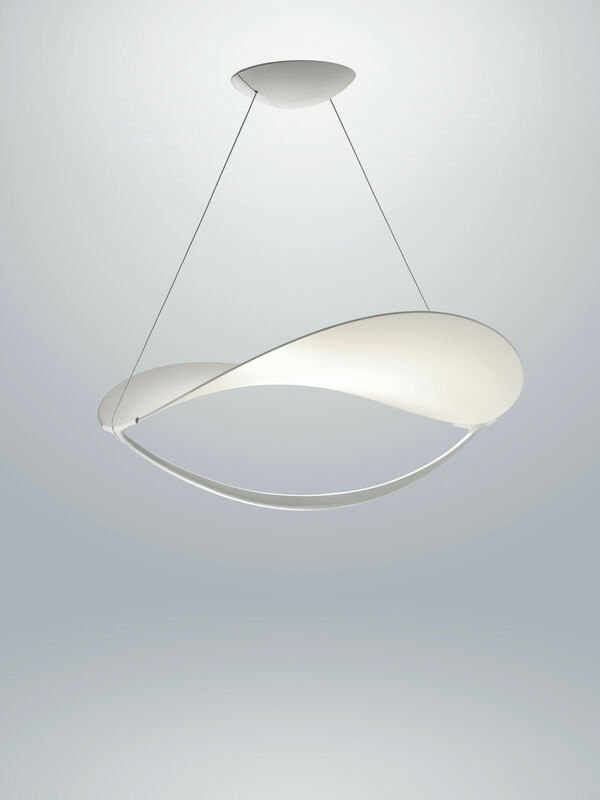 Plena is a cradle containing a light source that, like the essentials, is invisible to the eyes. The powerful COB LED light source is located in the middle of the petal, within the thickness of the fabric, hidden by a polycarbonate cover. 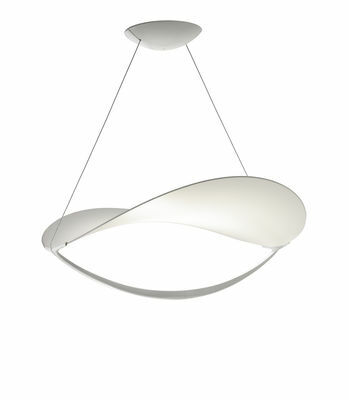 Plena offers dual quality lighting: the light is both directed downwards and diffused towards the ceiling. The result is a light with its own particular charm, capable of illuminating a whole room while remaining soft and enveloping. Placed over a table, Plena will never dazzle. A synthesis of form and function, mixing purpose and poetry, Plena is intended for both domestic and commercial use. Plena can stand alone, above a table for example, but can also appear in numbers in large spaces such as hotel lobbies, airports or large commercial spaces. This version is not dimmable (not compatible with a dimmer): also available in dimmable version. This lamp is available in ''MyLight'' version: a connected version that lets you control the lighting using a smartphone app (contact us).